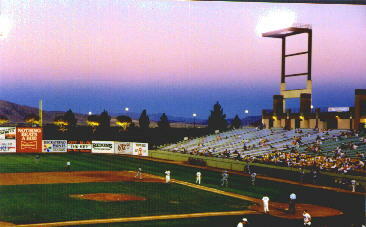 In 1991 I had the opportunity to visit two minor league parks in Las Vegas and Albuquerque. I arrived late to the game in Albuquerque but found a decent size crowd for a Pacific League (AAA) game. 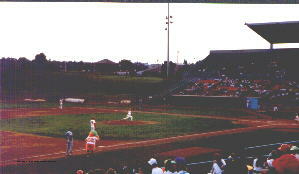 The most interesting character of the stadium is the left field terrace. 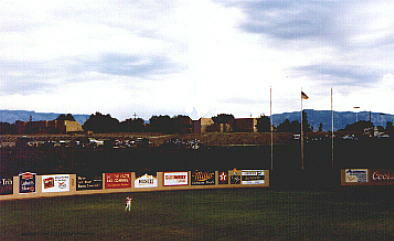 There are no bleachers: rather, a parking lot, elevated over the left field wall so that patrons may watch the game from the comfort of their vehicles. It is a kind of a "drive in" so to speak. On To Las Vegas NV, where the glitter and glamour of the casinos is much wilder than a Las Vegas Stars game. Actually, the team drew well but primarily a local crowd. 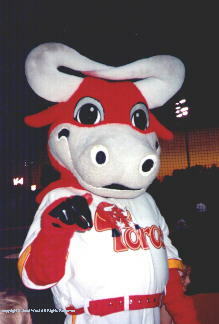 Not too many visitors like myself make the minor league circuit. Game time is 7:05 Temperature is 105 Degrees. PLAY BALL! Not too great a crowd on hand but a good game was seen and a good time was had by all. 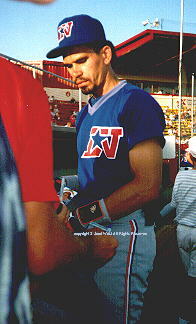 I shot a few photos there in 1992, note Benito Santiago in a visiting Las Vegas Stars uniform. 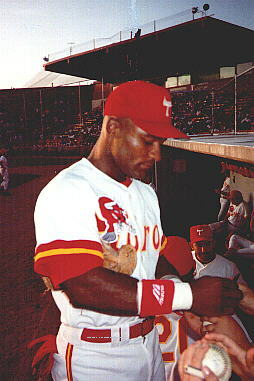 It is common for major league players to make unannounced appearances in minor league games, usually as part of an injury rehab. All Photos Copyright S Jaret West ALL RIGHTS RESERVED.